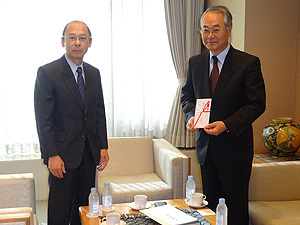 Offers for donations to the Institute were received from the Tokyo Art Dealers’ Association (NAKAMURA Jun, Chairman) and the Tokyo Art Club (MITANI Tadahiko, President). The Tokyo Art Dealers’ Association aims to fund publication of the Institute’s research results and the Tokyo Art Club intends to fund the Institute’s research projects. 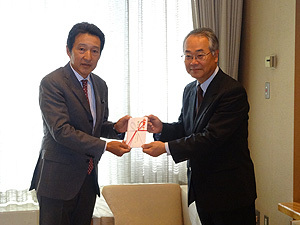 On December 24, we gratefully received the donations at the Tokyo Art Dealers’ Association. We are glad that both organizations are aware of our activities and are most grateful for their donations. We look forward to using these donations to fund our activities. 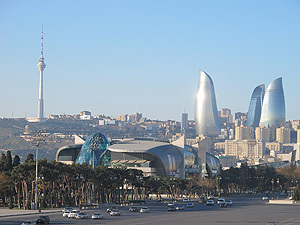 The 8th session of the Intergovernmental Committee for the Safeguarding of Intangible Cultural Heritage met in Baku, Azerbaijan from December 2 to 7, 2013. Three researchers from the National Research Institute for Cultural Properties, Tokyo attended the meeting to examine trends related to the Convention for the Safeguarding of the Intangible Cultural Heritage (the UNESCO’s 2003 Convention). 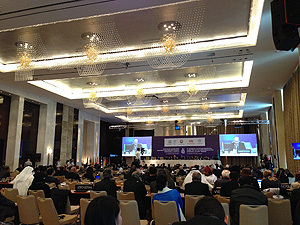 In the Intergovernmental Committee, State Parties are most interested in discussion of elements to inscribe on the Representative List of the Intangible Cultural Heritage of Humanity (the Representative List). During the session, discussion by the Intergovernmental Committee resulted in 25 elements being inscribed on the Representative List. Five of these, including “Washoku, traditional dietary cultures of the Japanese, notably for the celebration of New Year,” concerned cuisine. Inscription of Washoku was a topic of conversation in Japan. The items to be inscribed on the Representative List are cultural activities or traditions related to cuisine, but few people may be aware that what was inscribed on the list is not Japanese food (i.e. ways to prepare Japanese dishes) but is actually Japanese cuisine (i.e. Japanese dining culture). Another important topic was the ceiling of the number of files nominated for discussion. There had been a ceiling of 60 files a year that could be discussed by the Intergovernmental Committee, but the decision was made to lower that ceiling to 100 files in total for 2 years. Japan has long provided legal protection to intangible cultural properties, and Japan has numerous elements it wishes to nominate. Japan has adopted an approach of nominating a group of elements like Washi (Japanese paper), which it nominated this year. However, States Parties that have already inscribed a number of their elements on the Representative List are often asked to refrain from making nominations. In the future, Japan will probably be unable to vastly increase the number of its nominations. However, the aim of UNESCO’s 2003 Convention is to recognize diversity in intangible cultural heritage and protect that heritage through the inscription of various elements on the Representative List. Thus, countries must identify their intangible cultural heritage and they must accurately discern and document the properties of that heritage, but some countries are lagging in those efforts. Thus, Japan has ample latitude with which to make the principles of UNESCO’s 2003 Convention a reality by having Japanese experts provide support to countries around the world. 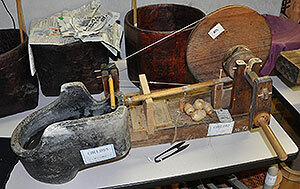 The Department of Intangible Cultural Heritage gathers information about traditional craft techniques and it studies those techniques. Riyo KIKUCHI of the Department of Intangible Cultural Heritage conducted a survey of the activities of the Tsukigase Society for the Preservation of Narazarashi (Tsukigase is a village in Nara Prefecture). Narazarashi is fabric made from hemp. Narazarashi is a “speciality” of Nara that was mentioned in the Wakan Sansai Zue (1712) and Bankin Sugiwaibukur (1732). These descriptions noted that “the best hemp has to be from Nanto (lit. the Southern Capital and another name for Nara),” and gained a national reputation during that era. Other descriptions mentioned that hemp from Nara could be distinguished from hemp from other regions when it was procured as a raw material. These descriptions provide a glimpse into aspects of the division of labor at the time. Techniques that have been handed down in an unbroken line since those times are being passed down by members of the Tsukigase Society for the Preservation of Narazarashi even today. 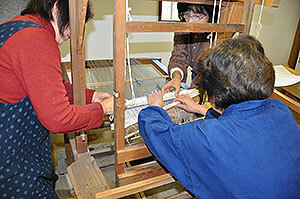 The raw material to make Narazarashi is now hemp from the Iwashima region in Gunma Prefecture. A framework to obtain raw materials is also found in other regions such as Echigo, where a hemp fabric known as Echigo linen is made. Dyeing techniques are not simply several local techniques. These techniques are underpinned by a number of people; straying from the passing down of those techniques is inconceivable. Greater attention should also be paid to the materials and tools that are essential to the passing down of crafts. This survey has spurred renewed consideration of the importance of community in preserving traditional techniques. 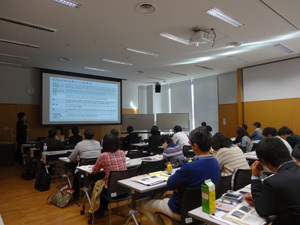 The 18th Local Training Course for Museum Conservation was conducted at Yamanashi Prefectural Museum to provide personnel involved in materials conservation at museums and archives in Yamanashi Prefecture with a basic knowledge of conservation. The training was done at December 11th and 12th and that was co-organized by the Institute and the Museum Kai Network. The training had 41 attendees from Yamanashi Prefecture. 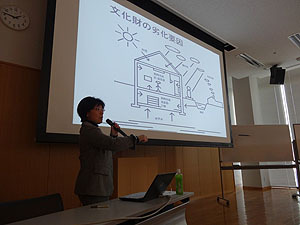 As a general outline, a lecture entitled “An Introduction to Conservation Conditions” (SANO Chie, Head of the Conservation Science Section) covered basic principles of and recent trends in materials conservation. This was followed by lectures on “Temperature and Humidity,” “Light and Lighting” (YOSHIDA Naoto, Senior researcher), “Climate Control” (SANO Chie), “Pest Control” (SATO Yoshinori, researcher in the Biological Science Section), and “Practical Methods for Conservation of Folk Objects and Artifacts” (KITANO Nobuhiko, Head of the Technical Standards Section). Folk objects and artifacts are kept primarily by smaller museums, but these museums truly lack the facilities and systems to manage those objects. Training accounted for the fact that many of the attendees would be from smaller museums. After the lectures, Yamanashi Prefectural Museum graciously permitted inspection of its facilities. Systems to manage conditions at the museum were explained in detail by curator Takahiko KUTSUNA. Mr. KUTSUNA provided great assistance with regard to the conduct of this training. A survey after training yielded numerous comments that the training was productive as well as requests to learn more about specific steps to take in accordance with conditions at specific institutions. We at the Institute greatly value communication with attendees after training as a way to meet the needs of conservators. Five countries in Central Asia and China have been involved in various efforts to nominate cultural heritage sites along the Silk Roads as World Heritage Sites in 2014. To support these efforts, the Japan Center for International Cooperation in Conservation (JCICC) has participated in UNESCO/Japan Funds-in-Trust Project, “Support for Documentation Standards and Procedures of the Silk Roads World Heritage Serial Transnational Nomination Dossier within the Framework of the Silk Roads World Heritage Serial and Transnational Nomination”: Uzbek Workshop and Sub-Regional Closing Meeting for 3 years since 2011 and JCICC has conducted various training workshops in countries in Central Asia. This workshop marks the final training workshop. The workshop was conducted from December 1st to 3rd in Tashkent, Uzbekistan at the UNESCO Office in Tashkent. Training covered Photographic Surveys of Cultural Heritage Sites. Fourteen young experts participated in the training. Once the training workshop concluded, We attended the sub-regional closing meeting of the project that took place in Tashkent on December 4th and 5th. The meeting reviewed the training program conducted by the National Research Institute for Cultural Properties, Tokyo and the University College London in countries of Central Asia. Representatives from different countries asked that training be conducted in the future as well. They specifically asked that training related to Surveys of Historical Buildings, Preservation of Sites, and Management of Cultural Heritage be conducted. 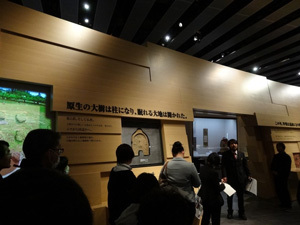 To help safeguard the Bamiyan site in Afghanistan, the National Research Institute for Cultural Properties, Tokyo and the Nara National Research Institute for Cultural Properties actively initiated a project to preserve the site starting in 2003. This project was instituted in conjunction with UNESCO and research institutes at home and abroad. Local Afghani experts and experts from different countries gather, and meetings have been conducted annually to present the results of the preservation project that year and to discuss policies for the years to come. In 2013, a meeting co-organized by UNESCO and the Italian Institute for Environmental Protection and Research took place on December 10-11th in the City of Orvieto, Italy. The meeting was attended by experts from Afghanistan, Italy, Germany, France, and Belgium as well as experts from international bodies like UNESCO, ICOMOS, UNOPS, and the World Bank. The meeting was also attended by Japanese experts from the National Research Institute for Cultural Properties, Tokyo, the Nara National Research Institute for Cultural Properties, Wako University, the University of Tsukuba, and Mukogawa Women’s University. Discussion centered on the current state of ongoing preservation of the Bamiyan mural paintings and fragments of the giant Buddha statues. In 2013, a German team installed “Feet”-like structures to ensure the safety of visitors of the Eastern Buddha statue. Experts from different countries presented various views as to the potential to use this structure to help rebuild the giant Buddha statue. Other topics that were discussed in detail were an envisioned museum/cultural center (Japan began actively submitting plans last year), the current status of preservation efforts that started in 2013 at sites around Bamiyan (such as Shahr-e Zohak and Shahr-e Gholghola), problems harmonizing economic development and protection of cultural heritage, and the current state of safeguarding of other cultural heritage sites in Afghanistan (such as the minarets in Herat).